The Eagles, once again, were not at their best Thursday night in Cleveland. 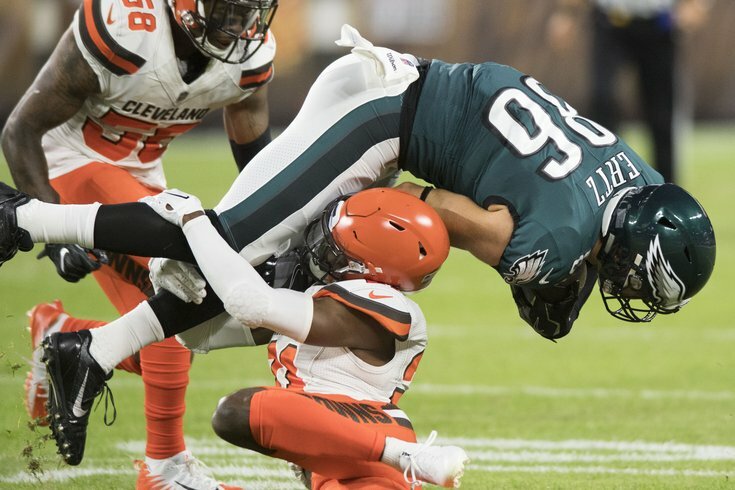 It's hard to know exactly what to make of what happened on the field in Cleveland Thursday night, as the Eagles frustratingly saw a worrisome lack of production from several key players and units in a 5-0 loss (yes, that was the real score) in their third preseason game. Smallwood did just enough to solidify his spot as the front-runner for the likely final running back spot on the 53-man roster. He ran for 53 yards on 12 carries, breaking a few big runs for first downs with the lion-share of touches. He was also helped by some teammate mistakes — Matt Jones among them, who fumbled on a catch in the second quarter. Josh Adams, the third contender for the spot, was decent in limited action accumulating 33 yards on four tries. After forcing a three and out and later allowing a few big plays to set up a first and goal in the first quarter, the defense bent but didn't break as an impressive stand at the one forced a turnover on downs. Consistent pressure by the Birds' pass rush was effective against all Browns quarterbacks, as Fletcher Cox had a strip sack before the end of the first quarter. Haloti Ngata and Jordan Hicks also got sacks with the first team defense. With so many Eagles wide receivers sidelined (Alshon Jeffery, Nelson Agholor and Mack Hollins to name a few), Carter is making it a hard decision for Birds personnel to decide between he and Shelton Gibson for a possible last roster spot. Serving as the primary punt returner, Carter showed he is quick, shifty and reliable. His 29 yard return in the third quarter had breakaway potential. In addition to grinding on special teams, Carter also nabbed four passes for 73 yards — the best in the Eagles' box score. His fourth down grab in the fourth quarter was particularly impressive, though not enough to avoid the shut out. The Eagles "back up" quarterback looked like a different guy Thursday — at least to start. After a putrid 4-for-9 debut last week that ended with a strip sack that hurt his shoulder, the Super Bowl MVP found his groove right out of the tunnel against the Browns, hitting Dallas Goedert, Zac Ertz and others in stride (though turning the ball over on downs on a failed fourth and five attempt. He was far from perfect, of course, as a trip in the end zone led to a safety and fumbled (thanks to some bad offensive line play). Foles, 13-for-17, 127 yards, committed a second turnover when a wobbly throw was picked off in the second quarter and a third on the goalline when he forced a throw into coverage just before halftime. The veteran cornerback had a relatively easy tackle for loss in his fingers on the opening play but he whiffed on it as Cleveland got a first down. Then, he whiffed a second time on a big Carlos Hyde run to set up an eventual goal-line stand at the one yardline. A Jason Kelce injury scare was averted but the first team offensive line did little to make Foles feel safe and sound behind center as Miles Garrett, among others, routinely forced the Eagles to make quick decisions with the ball. They also gave the run game nowhere to go early in the game. The second unit was no better as the Browns opened the second half with a sack as well. In total, Cleveland tallied six sacks in the game.